While the Affordable Care Act (ACA) increased the number of Americans with access to health insurance, U.S. employers and employees continue to struggle with rising health care costs and changing workforce demands. Recent Aon research shows that 20% of health care consumers cite high health care costs as the major reason they have either declined health care coverage, stopped taking medications, or avoided care altogether. If the U.S. health care system is to succeed, stakeholders across the health ecosystem must influence change in each market—employer, individual, and government (Medicare, Medicaid, and Tricare). 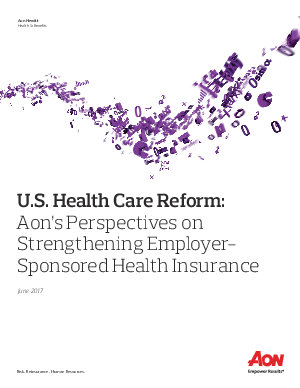 While each part of the three-legged stool is important, this paper focuses on five strategies Aon believes will strengthen the employer-based system—a system that provides health care coverage to well over half of Americans (61%, or 177 million).